"The Farewell Tour", this jaunt was being proclaimed. Having heard such proclamations in the past from a number of artistes, I could be excused perhaps if I were a touch skeptical here. But on this occasion, it did feel like the real deal. It was not Simon's vintage - 76, now - nor the fact his voice is undoubtedly showing it's age (also 76 !). But it was rather the fact that, so he told us, he was looking forward with genuine anticipation and enthusiasm to doing "other things", which helped convince me this was in all likelihood the last time PS would be setting foot upon a stage in Caledonia. Quite what these "other things" were, we were not, however, enlightened. 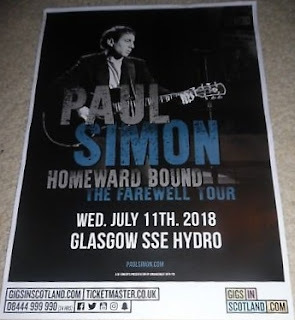 If this was to be his swansong tour, he certainly did not rest upon his extensive laurels - Simon choosing to perform songs from throughout his lengthy career; including a few, I am sure, no-one but the Simon-obsessives in the venue tonight would have been familiar with. Of course, a number of biggies were present, but we really were treated to quite an eclectic bunch of tunes. Care enough to share one zebra tear?" And whilst it was his Garfunkel era tunes which, inevitably, were most warmly welcomed this evening, those which really brought the place alive were the selection from the Graceland album. By slowing down and extending the intro to Diamonds on the Soles of Her Shoes, Simon and his impressive band effortlessly built the musical tension inside the cavernous Hydro until Mark Stewart's mbaqanga guitar break heralded in a bout of joyous jigging the likes of which I have rarely encountered at any gig. 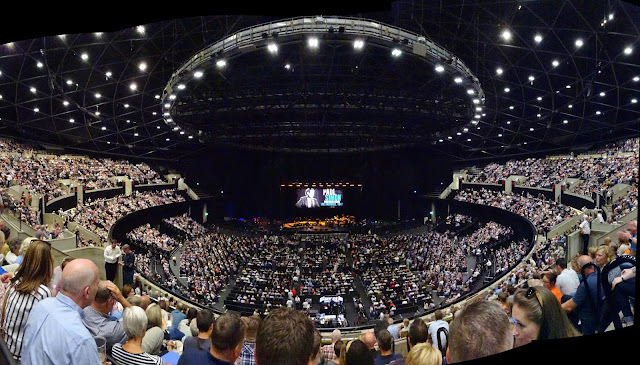 But it was those final five songs which made up the second encore which confirmed, if any of us with any duplicity of brain cells needed convincing, that we were in the presence of one of the towering songwriters of the 20th Century. And probably for the final time.